Our Chief Instructor George Ledyard Shihan began his Aikido studies in 1977 under the direct instruction of Mitsugi Saotome and has continued this association ever since. Ledyard Sensei currently holds the rank of 7th Dan in Aikido and Shodan in Daito Ryu Aikijujutsu (under Howard Popkin and Joe Brogna Senseis). He counts Hiroshi Ikeda, William Gleason, Howard Popkin and Joe Brogna (Daito Ryu Ginjukai), Mary Heiny, Tom Read, Endo Seichiro, and Dan Harden as strong influences on his Aikido. 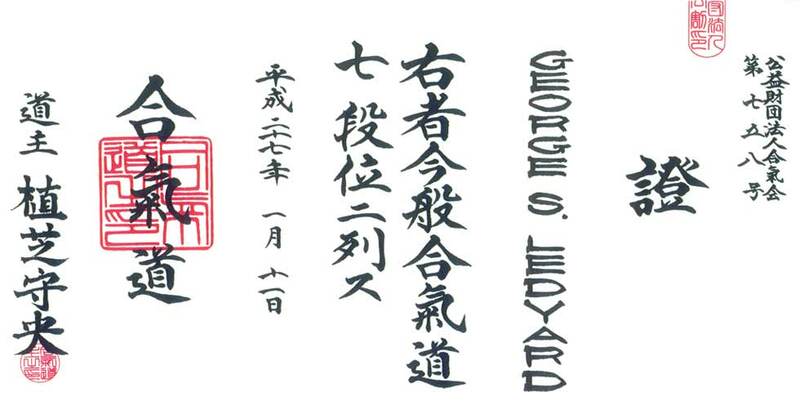 Ledyard Sensei was made a member of the Ueshiba Juku by Saotome Shihan. This connotes a direct line of “transmission” from the Aikido Founder, Morihei Ueshiba, through Saotome Shihan to his personally trained students. He is the Founder of Defensive Tactics Options™, a system of police and security training which specializes in less-than-lethal force alternatives and Options for Protective Control™, an ultra low-level force system for physical intervention with juveniles and emotionally disturbed subjects. As part of the 2015 Kagami Biraki promotions. Ledyard Sensei received his 7th Dan from Mitsugi Saotome Shihan. Sensei Ledyard believes that Aikido should be both a spiritual practice and a martial art. He is known for his work with the staff and sword and also for an innovative approach to applied empty-hand technique which brings in elements from his training in Japanese Koryu, Iaido, Filipino martial arts and Systema. He has over thirty five years of Aikido teaching experience. In addition to teaching Aikido seminars internationally, Ledyard Sensei was invited to participate in the first three historic Aiki Expos and is a regular contributor to both AikidoJournal.com and Aikiweb.com. 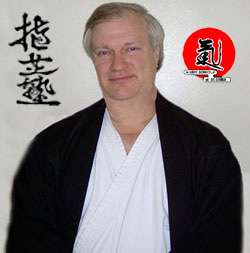 He is the author of over many Aikido instructional DVDs on empty hand and weapons (www.AikidoDvds.Com). Just wanted to thank you again for your visit to our Coventry dojo. I must say that it was without doubt the most inspiring and useful aikido seminar I have ever attended in my 8 years of training. I know I am not alone in feeling that it will profoundly effect my future aikido practice and attitude toward the art (I’ve never known a seminar to generate this much discussion and hard thinking amongst my aikido peers!). My good friend Todd Jones Sensei made this video from footage of my classes at the 2012 Orlando Aikido Bridge Seminar. It’s a kick!